I just got back from competing in the Canadian Nationals. I missed playing it the last few seasons because of knee problems, so just to be back on court and competing was a win for me. Unfortunately I had trouble backing up a tough match and lost in the finals of the 35+ 3-1. Anyways, this isn't a post about me so let's move on. Today I'm going to talk about the men's and women's open events. 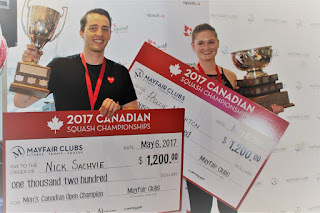 Here's a link to all the draws if you would like to check out the full results: http://squashcanada.tournamentsoftware.com/sport/draws.aspx?id=984B9FE1-9DAC-427F-A4BE-76D48ABFBF60 Being around squash for my whole life you get to know almost everyone and you get to see juniors rise up and become some of the best players in the country. Canada has had some success on the PSA circuit over the years and we all look up to the footsteps of Jonathan Power (who for the record did not play this year). There was a good blend of some competitors around my age who are nearing the end of their careers and others are just beginning. Shawn Delliere and Shahier Razik have both won a number of the mens' titles over the years and Sam Cornett was back after missing last season due to injury. Cornett has had lots of great results on the PSA tour since her comeback so most people were favouring her to recapture the title. Hollie Naughton was the defending women's champ and Andrew Schnell was last years champ on the men's side. The women's draw is the most competitive I have ever seen. Canada has a number of women ranked in the top 75 in the world (I believe 5) and there are others playing close to this caliber. Although the women's draw was smaller the caliber and competitiveness was good. It was encouraging to see a couple of the top local juniors in the mix. The women's semis were set with the top 4 seeds and both matches were incredibly tight. Unfortunately both ended with bad calls by the ref. Down 10-9in the 4th and 2-1 in games Cornet had the momentum, but Letourneau was awarded a stroke for a simple let and the entire crowd gasped in shock and was vividly not happy with the call. I was thinking as watching this that if Cornett had won that point she was going to win that match, it was that critical. Shame when you see something like that. In the other semis (which I didn't see all of) I heard there was a wrong call at 9-9 in the 4th against Nikki Todd which gave Naughton match ball. I was worried about the refing from my very 1st match when I was awarded a no let when I hit my opponent during my swing which caused my ball to hit the floor. I don't know if the refs have got a new set of rules they're using. I don't like bringing up this topic again, but anytime a ball was hit lose it was either a 'no let' or a 'stroke.' It was really strange and you never knew which was coming regardless of the amount of impedance of the swing. There was no consistency with these calls. In my semis my opponent and I agreed to change poor decisions twice and the ref got angry and asked if we even wanted him to ref. I realized quickly it was not worth arguing or getting upset about any calls, you just hope they didn't occur in big points and unfortunately for the women it did happen in big moments in incredibly exciting and well fought matches. Moving on. After Letourneau had caused a big upset and taken out Cornett I felt it was going to be very tough for her to mentally and physically back that up in the finals against Naughton. Letourneau was up 2-1 in the finals when you could see she was getting a bit fatigued and forcing the ball short too early and from defensive positions. Somehow it's kind of encouraging knowing the top players struggle with the same things everyone else does at times. Naughton went on to win in 5 and is the defending champ. But with the depth and caliber of the women in the field this title will be up for grabs every season! On the men's side there were also plenty of upsets. The defending champ, Schnell lost in 5 to Mike McCue while less surprising was Nick Sachvie who beat Shawn Delliere in 3 straight. Sachvie has been climbing up the PSA ranks quickly and cleaned up during the weekend without dropping a game. Watching Sachvie play I felt like he has less obvious areas to work on than the other guys do. His movement and court coverage is unbelievable and super efficient. It would have been nice to see him tested and to see how he handles the pressure of tight matches. He definitely has the ability to continue cracking on up in the men's rankings. It's all going to come down to the tactics and mental game. He's got the movement and the racquet skill. If he can get out on court with some of the top pros I'm sure it would help him continue his rapid development. That's the challenge here in Canada when you become the best. Since the NSA has closed their doors there is no set place and team for upcoming pros to go train. Currently a group of them go to club in Toronto and work with a couple of the coaches there, but it doesn't have the draw or appeal of a place like the NSA and JP did. I thought they caliber of squash was very high in the men's too. It will interesting to follow the men and women as some careers are winding down and others are just getting going. The top 4 Canadian women all have the ability to crack the top 30 and there's a few after that who aren't too far behind them. Sachvie seems to have the clear cut edge in how far up he can get up the rankings. I could see him making top 30 or even 20 in a few years, but at that stage you need to be getting regular hits with the top guys and on the glass court. Schnell is extremely fast and an amazing athlete and has already had some success getting into the top 60 and winning last years title so convincingly. We all know Razik and Delliere have already reached impressive previous career highs a few years back. I believe Razik got to the low 20's and Delliere around 30. Neither could find success on the glass court against the top players so let's hope our next crop of players can do better at this transition. Did you watch Nationals is person or on the streaming? Let me know your thoughts. And if you haven't already checkout out the new Serious Squash film, The Secrets of Solo Hitting has now sold almost 100 copies to people from all over the world. It's a 64 minute advanced instructional video on how to solo hit most effectively. Pick up a copy at SeriousSquashShop.com/collections/coaching-videos and if you'd enjoy it I will give you a full refund! Good recap. I saw the matches a little differently and thought Letourneau was going to prevail whether that stroke was called or not. I didn't think the call was as egregious as some, though I do think match point magnifies things and turns an "iffy" call into a "terrible" call just because of the context. I don't like to rip on the refs too much, though there was a very bad call where - after a rally was over - a player said a ball had been out in the middle of the rally. The ref said, "Let's play a let." Huh? Of course the other player cried foul and it turned silly. That said, players who use their path to go looking for lets instead of the ball and cause a lot of these decisions to be made draw my ire more than officials do. I hear you about missing the NSA, though I only visited it once because it was so out of the way from downtown. I think people liked it because it had a good attitude about growing the game of squash, as opposed to being a "gym." Proof is in the pudding, though, as they're closed now. So something was wrong with their model, ie, being able to pay rent. All it would take for a gym or club to become a powerhouse of squash would be to 1) tell any pro that the gym will waive any initiation fee and let them play half price or less if 2) the gym can use their name and picture for any marketing materials they desire, like social media, pamphlets, newspaper ads, a sign outside that says the Home of Canadian Champion Player Joe Blow, so forth. Give the players something tangible and the players will be happy to play there. Treat them well, and they'll stay. Unfortunately, I think this is beyond the thinking of most, if not all, gyms and clubs, especially in the GTA.